Vladimir Kramnik has rejected his invitation for the 2017 Grand Chess Tour, citing a busy schedule that would have made playing four tournaments a problem. 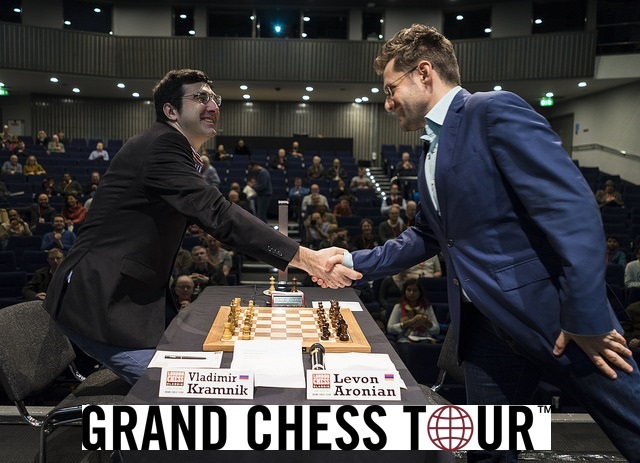 Levon Aronian takes his place as first reserve, with the full line-up for the $1.2 million series featuring all of the world’s top nine players except Kramnik – Carlsen, Caruana, So, MVL, Anand, Aronian, Nakamura and Karjakin – as well as Nepomniachtchi. Kramnik could still potentially take part in individual events as a wild card. 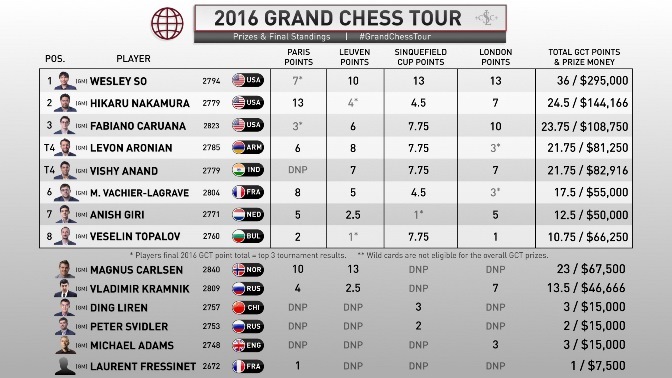 The American triumvirate of So, Nakamura and Caruana finished 1-3 in the 2016 series and automatically qualified. I would have gladly participated in two, but not four. Since their regulations do not allow this, I have to miss all of them. The lucky beneficiary is Levon Aronian, who failed to qualify directly but was named as the reserve player in case anyone else dropped out. The Armenian no. 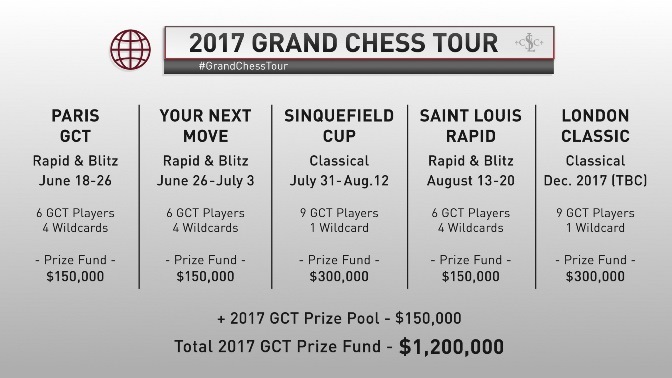 1 will of course be no stranger to the field, having played in the previous two Tours and every edition of the Sinquefield Cup. The rating system has been developed by well-known authorities such as Mark Glickman (the inventor of the Glicko rating system) and Jeff Sonas (the man behind the Chessmetrics historical ratings website) and claims to have greater predictive power than the Elo system at all time controls. It works by using modern computing power to generate a performance rating for each player based on all the games played over a multi-year period, with ratings not fixed even if a player doesn’t play any games. The authors explain (e.g. here and here) that although the system has been calibrated to use numbers roughly similar to the current FIDE ratings, the calculations don’t involve FIDE ratings and the whole system operates differently. It’s clear that if the system eventually takes off then URS and FIDE will be on a collision course, but for now the main purpose of the system will be to determine the rating qualifiers for the 2018 edition of the Grand Chess Tour. 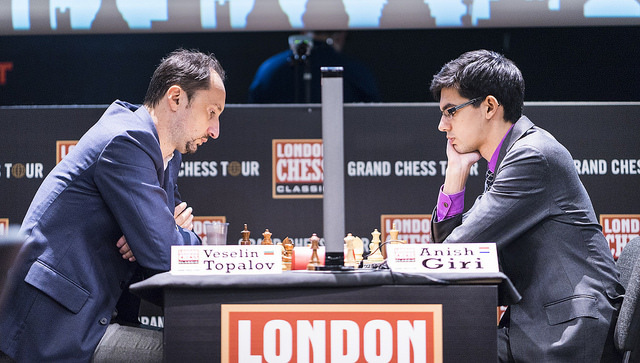 Despite the complicated selection procedure the only changes in the Grand Chess Tour line-up compared to 2016 are that Veselin Topalov and Anish Giri have been replaced by Sergey Karjakin and Ian Nepomniachtchi. Neither had years they’ll remember fondly for chess reasons, though both saw their families grow in 2016. 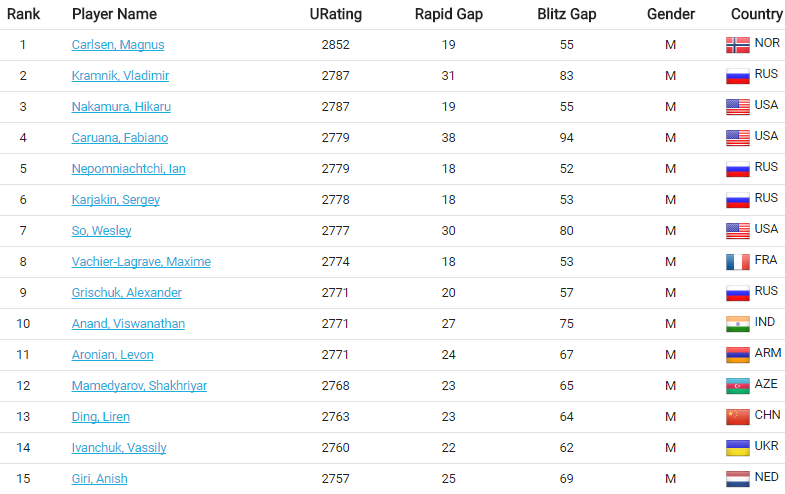 While Topalov’s fall from grace perhaps made it inevitable that he’d miss out, Anish Giri remains in the FIDE Top 10 and might still have hoped for a wild card. Instead he’ll get a chance to play in different tournaments, after recently being announced as the top seed for the Reykjavik Open. Dmitry Andreikin, Baadur Jobava and Alexei Shirov are among the other participants. It’s going to be a very busy year (see our 2017 Chess Calendar), with the FIDE Grand Prix also cramming four events into what was originally intended to be a 2-year cycle. The first of those is set to be the Sharjah Grand Prix starting on 17 February. So far, with just over two weeks to go, the players in the series haven’t been announced, with the controversial option to “buy” a player’s place for 100,000 euros in sponsorship adding to the usual uncertainty over which of the qualifiers will accept their invitations. A press conference has been scheduled for 6 February, when we can hope to learn more.